When you book a ticket on a budget airline, you have to accept the fact that you're going to miss out on a few amenities in order to save a few bucks. That could mean having to squeeze into a smaller seat or paying a-la-carte for snacks you'd usually get for free on another carrier. 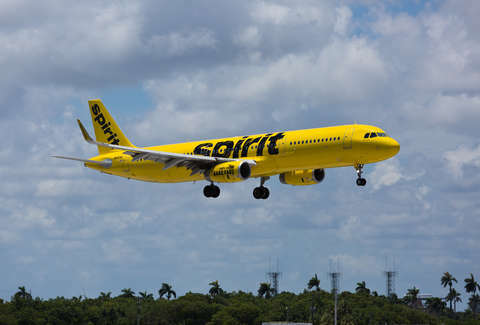 But hopefully, you'll never have to endure a noxious "dirty socks" stench like passengers aboard a recent Spirit Airlines flight did before the plane made an unexpected landing. The stinky ordeal went down Thursday on a Ft. Lauderdale-bound flight out of New York's Laguardia Airport when a mysterious and potent odor similar to that of rancid, dirty socks caused at least 10 passengers of the 220 on board to experience chest pains and complain of burning throats. It got so bad mid-flight, that the decision was eventually made to divert the plane to Myrtle Beach, South Carolina. Once on the ground, passengers were taken off, and between seven and 10 were sent to local hospitals to get checked out. Hazmat crews boarded to scope things out, but were unable to trace the smell to any substance or chemical leak. Eventually, passengers were able to board a supplemental aircraft that was sent to continue them on their journey, and they made it to Ft. Lauderdale by around 5am Friday morning, roughly five hours after they were scheduled to land. As of now, it's still unclear exactly where the smell was coming from, but let this serve as a friendly reminder that it's kind of gross to go shoeless on a plane, and that if you do decide to let your barking dogs breathe, for the love of god make sure they don't stink.